The World Taxidermy Championships is truly an open competition. Participants are free to compete on any level — Novice, Professional or Master Division–simply by making a choice according to their level of skill. Taxidermists who choose to compete in the Master Division, Collective Artists Division, Interpretive Division and the Taxidermy Sculpture Division will have their entries judged head-to-head against other entries in the same subcategory. Single first, second and third place ribbons are awarded. The judges’ choice for the best entry from each of the sixteen major Master Division categories as well as one entry from the Collective Artists Division and one entry from the Taxidermy Sculpture Division may be named “Best in World” and the competitior earns the World Champion title. Entries in Professional Division, Novice Division, and Youth Division are judged according to their individual merits with a numerical score and are not judged against other entries. There is no limit to the number of ribbons that can be awarded in these divisions. 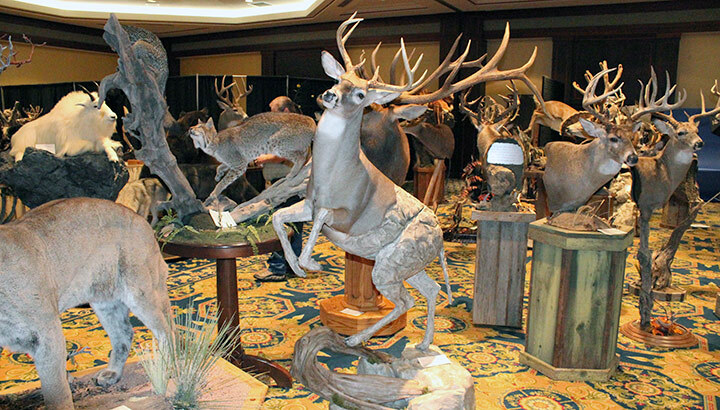 The World Taxidermy Championships® is a competition where taxidermists at all levels can compete. The Masters Division, the division from which World titles are selected, is usually competed in by seasoned competitors who have earned more than one First Place at other competitions. This is a single-ribbon division where many excellent, high-scoring pieces will not place. The Collective Artists Division is for entries that are worked on and prepared by more than one person. Studios, where several people work on a piece, can compete for a special World title. It’s also the division where friends can unite their efforts to produce a truly outstanding piece. This is a single-ribbon division with six categories and one World Title awarded. The Interpretive Taxidermy Division is where a competitor can take his or her artistic talents and a fertile imagination to a new level and see what happens. Some of the technical burdens of conventional competition are lifted because the display will not be scrutinized with a flashlights and/or finger-probing. The goal should be to convey the essence of the species in an artistic presentation. The Professional Division, which offers multiple ribbons in twelve categories, usually has the most entries in the World Taxidermy Championships. This division is for professional taxidermists, even for those who have never competed. The Novice Division is for beginning taxidermists who feel that their skills have not developed enough to compete effectively in the Professional Division. Multiple ribbons are offered in ten categories, with the main emphasis on teaching the competitors. The Youth Division is open to taxidermists who are 14 years or younger. Multiple ribbons are offered in ten categories, with the main emphasis on teaching the competitors. New Habitat Division This division is for realistic habitats, not interpretive renderings. Anyone entered in the Professional, Novice, Master, and Collective Artists divisions can also enter the habitat portion of his or her entry in this new Habitat Division. The Live Taxidermy Sculpture Division is open to eight entrants who will be sculpting a lifesize mammal or gamehead within a 24 hour time period. This is a single-ribbon competition with one World Title awarded. The Taxidermy Pre-Sculpted Division is open to any sculptor who would like to enter a completed taxidermy clay sculpture. This is a single-ribbon competition with two categories. The Bronze Wildlife Sculpture Invitational is open to any bronze sculptor who would like to enter and display a completed bronze sculpture. This is a single-ribbon competition with four categories, voted on by the World Show competitors. Category 1. Medium-Small Mammals (smaller than 75 lbs. [coyote/peccary]). Note: Juvenile mammals will compete in a subcategory of comparable size. Example: a newborn whitetail deer would compete against small mammals, whereas a 2-month-old whitetail deer might compete against medium mammals. The Competition Chairman will make all final decisions on which subcategory a juvenile animal would be entered. Single first, second, third place ribbons chosen by the five Interpretive Division judges. First Place: 90 or above. Second Place: 80-89. Third Place: 70-79. Open to current or former World Taxidermy Championships judges, alternate judges, former winners of a Best in World title or First Place Master Division winners in any category. This division is for realistic habitats, not interpretive renderings. Anyone entered in the Professional, Novice, Master, and Collective Artists divisions can also enter the habitat portion of his or her entry in this new Habitat Division.